Here’s a clever 1 ingredient recipe sure to please zombies and fruit lovers alike. And how can you not love a recipe with instructions like “With a sharp paring knife, carve channels out of melon to resemble cortical folds”? 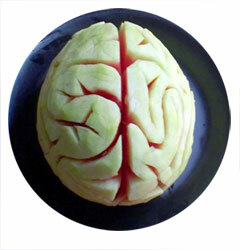 Serve with a butchers knife and you’ve got an easy and fun to serve healthy Halloween party food. 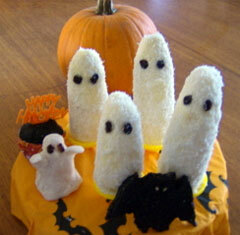 Another ridiculously easy recipe that transforms fruit into a spooky and fun snack. There are a few more healthy Halloween recipes from GoneRaw.com that feature whole foods, all of which I’m dying to try. Subscribe to comments with RSS or TrackBack to 'Fun Healthy Halloween Snacks'. These are some great recipes. Trick or treat is Thursday here. I’m planning on making a creepy meal for the kids. One of these years I’m going to “out-gross” them. 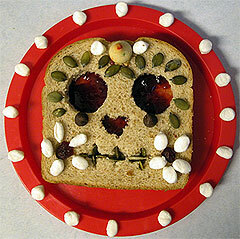 Thanks for featuring my calavera sandwich!